The checkbook displays date, vendor name, amount of payment, and the source of funding. Mayor Bart Castleberry announced this week the launch of an Open Checkbook for the City of Conway. "We want to be transparent to the public about how their tax dollars are spent, and this is a big step in that direction," said Castleberry. The open checkbook is viewable on the city's website and is modeled after state law that requires the publishing of expenditures by state agencies. The Department of Information Systems & Technology, with assistance from the chief financial officer and communications coordinator, developed the system. "Conway is proud to lead the way with this initiative, and we think we might be one of the first cities in Arkansas to implement an open checkbook system," added Castleberry. "Mayor Castleberry has been crystal clear, since day one, that the citizen's of Conway come first and we have been pleased to assist in the effort to make this financial data available," said Aaron Knight, information systems and technology director. New street sales tax funds will not be made available until June 25, 2018. This is when our first funds will be returned to the city by the State of Arkansas. 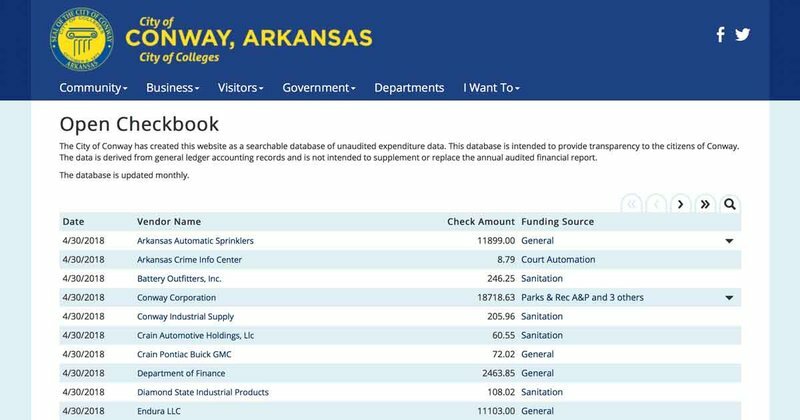 The open checkbook will be updated monthly and is viewable at conwayarkansas.gov/transparency.